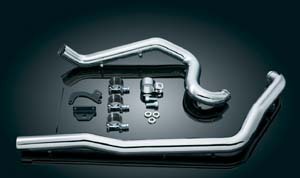 VTM-940: M8 true dual exhaust header kit includes 30" straight fishtail set, without baffles. Use existing hardware and clamps from stock exhaust system for installation. Fits: 2017 and up. TDK Crusher True Duals: The total package. Revitalize your engine and heavy-hand the throttle. Bottomless growl with trusted results. 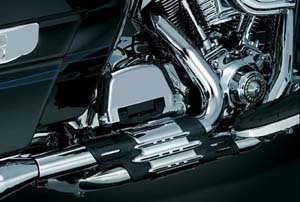 Each cylinder breathes through its own header and muffler for enriched airflow and unmatched power. Includes all heat shields and mounting hardware necessary for installation. 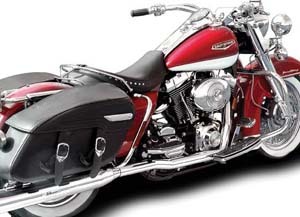 TDK-513: Fits: '95-'08 Electra Glides, Road Glides, Road Kings, Street Glides & Tour Glides. Chrome. TDK-516: Similar to above but for model year '09-'16 Electra Glides, Road Glides, Road Kings, Street Glides & Trikes. TDK-543: Similar to TDK-516 but in Black. TDK-567: Renegade styling for bold bikers. Embossed stainless steel bands and signature precision-machined billet aluminum tips. Deep reverberation, solid power gains and incomparable looks. The Maverick is a must-have for your Dyna, Softail or Sporty. Chrome & black ceramic coated mufflers with embossed stainless steel bands and black ceramic coated billet aluminum tips. High flow louvered core baffles are maintenance free - never need repacking. Solid horsepower and torque gains. Made in the U.S.A.
TDK Crusher Duals w/Power Cell: Crusher Duals with Power Cell integrate a unique crossover for increased horsepower and torque. Like having an ace up your sleeve, the crossover is hidden by a clean looking, stylized heat shield. With Crusher Duals, heat is drastically reduced for the passenger. Much like the stock 2009 design, the left pipe is no longer routed above the left footrest. It runs beneath the motorcycle, well away from the passenger's feet & legs. Crusher Duals with Power Cell include heat shields, mounting hardware & are fitted with oxygen sensor ports. All that's left to do is choose the mufflers to complete your high-performance package! TDK-588: Crusher duals with Power Cell. 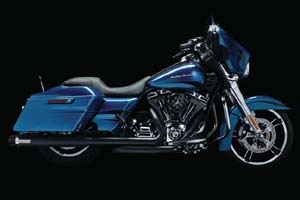 Fits MY '10 - '12 Electra Glide, Road Glide, Street Glide & Road Kings. 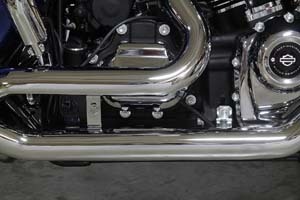 Note: '10 FLHX, FLTRX require Left Side Muffler Mount Kit (P/N TDK-560). 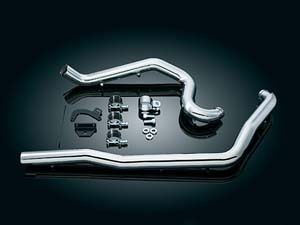 TDK-561: Trike Exhaust Adapter Kit (pr). 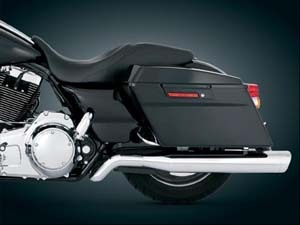 Note: Required to install P/N 488 or P/N 588 on ’09-’12 Tri Glide & Street Glide Trikes. TDK-560: Muffler Support Bracket & Rubber Grommet (ea). Fits: ‘95-’12 Touring Models (Mounts 1 muffler). TDK-488: Crusher duals with Power Cell. 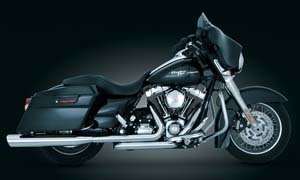 Fits MY '09 Electra Glide, Road Glide, Street Glide & Road Kings. TDK Crusher True Duals: We've combined performance & great looks into one package. With stock head pipes, nearly all the exhaust from both cylinders is routed out the right side muffler. With Crusher True Duals, each cylinder breathes through it own head pipe & muffler, greatly improving flow & making the bike much easier to tune. Crusher True Duals include heat shield & mounting hardware. The '07-'08 versions are fitted with oxygen sensor ports. 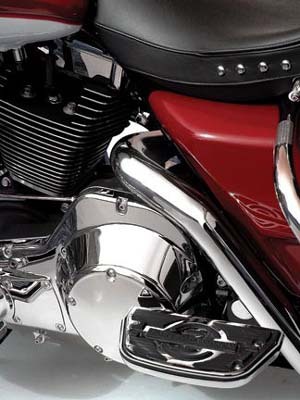 All that's left to do is choose the mufflers to complete your high-performance package - Crusher or Beast Ovals!Fits: Electra Glides, Road Glides, Street Glides, Tour Glides, & Road Kings. 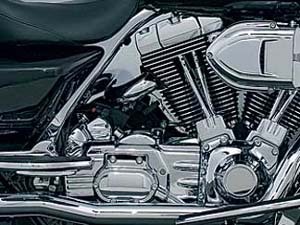 Note: '95-'06 motorcycles equipped with aftermarket ECU's with 02 sensors must order Crusher True Dual Head Pipes (P/N TDK-497) & '95-'06 Exhaust Bracket (P/N TDK-494). Some motorcycles may require slight modification to Bracket P/N TDK-494. TDK-476: Crusher True Duals. Fits: All ’10 Models (set) Note: FLHX, FLTRX require Left Side Muffler Mount Kit (P/N 560). TDK-496: Fits: '95-'06 Models (set). TDK-497: Fits '07-'08 Models (set). 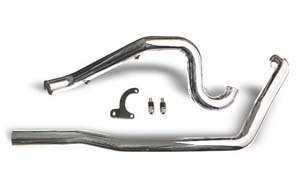 TDK-494: Fits: '95-'06 Exhaust Bracket. TDK-477: Crusher True Duals have been designed from a clean slate for the 2009 H-D Touring machines. 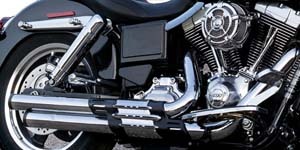 They eliminate the stock crossover to provide the performance of an actual "true dual" system for 2009 Electra Glides, Road Glides, Street Glides, & Road Kings. With Crusher True Duals, heat is drastically reduced for the passenger.Much like the stock 2009 design, the left pipe is no longer routed above the left footrest. It now runs beneath the motorcycle, well away from the passenger's feet & legs. Crusher True Duals includ heat shields, mounting hardware & are fitted with oxygen sensor ports. All that's left to do is choose the mufflers to complete your high-performance package! 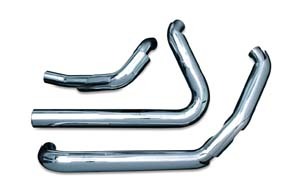 TDK-514: Most of the staggered style exhausts on the market perform very poorly. The Crusher Power Cell Staggered Duals have a crossed flow cell that makes this pipe perform like a 2 into 1 but look like a unique staggered dual with an awesome deep sound. Fits Dyna model year '06 - '11. TDK-SWB: Same as above for MY '12 Switchback. TDH-96, TDH-97: These True Duals are a premium quality exhaust to rival all others in every way. 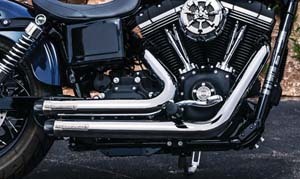 Designers used their artistic flair and computer aided design to come up with some of the hottest looking head pipes and mufflers ever offered for a Harley Touring bike. These have all the characteristics wanted in head pipes and mufflers. Performance was at the top of the list. Killer power with nice full torque curves. Sound was right up there with performance. A low deep rumble with no swishing, tweeting or tinny noise was the goal along with a mellower sound level when cruising. Under full power the mufflers had to talk though, and what they needed to say was this was no bike to be messed with. • High tech stainless steel packing for added longevity! • Acoustically tuned for that deep low rumble you will love! • Lower decibel levels at cruising speeds! • Authorative growl at wide open throttle! • Performance throughout the RPM range! 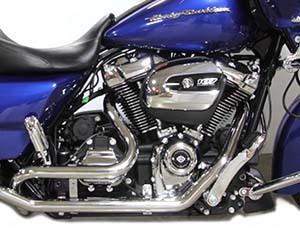 • Full heat shields on true dual head pipes! • Looks to die for! • Quality only Kuryakyn can bring you!